During its inception in 2004, not in their wildest dreams would the team at The Rack Group believe that Rack Armour would be the as successful as it is today. That it would go on to sell in well over eighty countries and manufacture on three continents. That the world’s biggest brands would install and continue to support the product globally, brands such as Wal-Mart, Tesco, BMW, Audi, Office Depot, Lowes, Mercedes, IKEA, Kellogg’s, Kraft, McDonalds, Nestle, Toyota, Pepsico, Coca Cola, DHL, and Eddie Stobart. 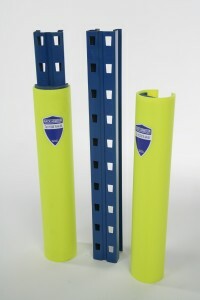 Rack Armour was created initially as a product to reduce racking damage for The Rack Group’s biggest customer. The aimwas to produce a cost effective solution that would continually reduce racking repair costs. After looking through the market for existing products, it became obvious there was no such product. Metal protectors easy buckled and dented, often creating more of an issue than a solution. The plastic protectors available on the market at that time were often bulky, taking far too much space from the pick location, again creating a hindrance. After months of research and testing we came up with the Rack Armour product you see today, a cylindrical HDPE shell teamed with an absorbing foam interior, capable of dissipating impact energy effortlessly. Rack Armour was an instant hit, saving one customer £1,000,000 in racking repair costs in one year alone. Many of the original units are still installed on the original sites after more than eight years, with only the foam needing replacement, highlighting the obvious benefit of installing the guard over anything else. Word soon spread of Rack Armours effectiveness, with manufacturing operations in the USA and Australia following to cope with global demand, giving Rack Armour a fantastic platform to produce and distribute the product throughout the world. Then, in 2014, Rack Armour looked to develop a cost effective end of aisle barrier range, something new and existing customers were crying out for due to the lack of options in the market. This barrier range soon expanded through demand from customers, now consisting of over twelve barrier types including pedestrian segregation options.